Robin og C. Matthew Luther kombinerer video, fotografi, trykk, skulptur og performance for å skape ulike uttrykk som strekker seg fra små, intime fotografiske studier av omgivelsene, til større skulpturelle inngrep i landskapet. Arbeidene deres opptar menneskelige forhold innen ulike samfunn og menneskers forhold til naturen. “During our visit on Sula Island we experienced our unique surroundings through photographic and video studies. Small Inkjet and Photogravure Prints illustrate our explorations as outsiders in this new space. The video Someone from Sula combines the stories and memories of Sula residents with imagery of the landscape and playful, narrative interventions in the geography. 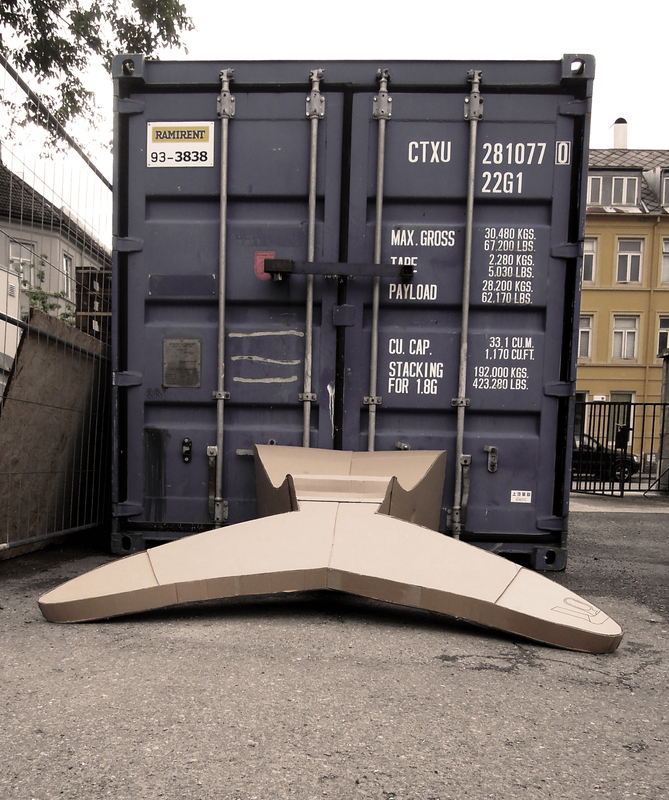 During our residency at LKV we constructed a large sculpture of a whale using recycled cardboard boxes. The wearable, near life size whale will be paraded through the streets of Trondheim before being displayed in Babel. The whale’s journey through Trondheim will be documented and presented through Video and Inkjet Prints”. Robin Luther og C. Matthew er amerikanske kunstnere basert utenfor Milwaukee, Wisconsin. Robin Luthers arbeider består av fotografisk og tidsbaserte multimedia installasjoner som utforsker hvordan geografiske forhold oppleves og huskes. Hun har en Bachelor i fotografi fra Columbia College i Chicago og en Master fra Universitetet i Wisconsin. http://www.robin-luther.com. C. Matthew Luther arbeider med maleri, trykk og video som utforsker det menneskelige forholdet til naturen, visuell hukommelse, det underbevisste og dets effekt. Matthew har en Bachelor med vekt på trykk og fotografi ved Southern Oregon University og en Master i maleri fra Universitetet i Wisconsin. http://www.matthewluther.com. Robin and C. Matthew Luther uses a combination of video, photography, printmaking, sculpture and performance to create a variety of forms – from small, intimate, photographic studies of their surroundings to large-scale, sculptural interventions in the landscape. They are concerned with the ecology of human relationships within communities and human relationships with nature. Robin Luther and C. Matthew Luther are American artists and art educators based out of Milwaukee, Wisconsin. Robin Luther’s work consists of photographic, and time-based, multimedia installations that explore the multi-dimensional ways in which geographic locations are experienced and remembered. She holds a BFA in Photography from Columbia College Chicago and an MFA from the University of Wisconsin, Milwaukee. http://www.robin-luther.com. C. Matthew Luther is a painter, printmaker and video artist whose work explores the human relationship to nature along with the connection of visual imagery to memory, the subconscious and its affect. Matthew holds a BFA with an emphasis in printmaking and photography at Southern Oregon University and a MFA in painting at the University of Wisconsin-Milwaukee. http://www.matthewluther.com.